I noticed a conversation on a local Facebook group about this and wanted to see what you thought. A kid wrestling for a high school team apparently skipped his school's last tournament of the year prior to the postseason, assuming with the blessing of the head coach, and went to wrestle at the tournament in Tulsa this past weekend. One side of the argument is that he should be allowed to do this because he is exceptionally talented, and rightfully is, because he would not get the same level of competition at the tournament his school attended. The other side is that he should not put himself above the team and that if he chooses to wrestle for a club during the high school season then he should just do that and not compete for his school due to the commitment of being part of a high school team. What do you think? One guy said he would dismiss him from the team if he were the high school coach. Last I understood, Colorado does not let kid wrestle on club teams and high school teams in the same season. I could be wrong. Dismissal from the high school team is extreme. This needs to be worked out with the coaches as early as possible. I see no issue if the parents bring it up at the parent meeting early in the season. If the coach did not give permission and the parents/kid did this on their own then dismissal or suspension from events is definitely on the table. In most states however they would need a waiver to participate in that type of event. Happens every weekend in California. You get teams that are decent with 1 or even 2 studs. Cant send 13 guys to Battle For The Belt or Doc B who will surely go 0-2. You send your champ there and let the backup go to the local tournament. No one thinks twice about that over here. There's a difference between sending school affiliated teams to two events the same day. That's a state by state issue- some allow, some don't. This was the kid going to an event outside of the state and NFHS and representing someone other than the school. Some states have loose enough rules that savvy parents can take advantage. I believe the punishment for the state in which the OP resides this wrestler will lose the post season only with no punishment for the next season. If's hes not a varsity kid then no harm no foul as they say. A couple years ago a situation arose where that state association did not have an adequately worded in season participation restriction and several high school kids did participate in a private event after their first sanctioned event with no punishment. That may or may not have been corrected. He would not be eligible in Tennessee to wrestle for the varsity team again after he competed at Tulsa, OK. You may not compete for both your high school team and your club team during the official high school season. This would cost the young man one (1) year of varsity eligibility. One year (next season too) or just the rest of the current season? Any Virginia people recall this happening with Blake Roulo from Matoaca? I think he chose to wrestle in an age group event during the HS season, might have even been Tulsa, where he faced 8th grader Taylor Massa (Roulo was in HS but they were same age per this event). of course I'm old and feeble so this could all be fiction. Roulo started at Buffalo and qualified for the NCAAs and transferred and finished out at George Mason. Heâ€™s an assistant at Averett University now. Of course you allow it. Wrestling is an individual sport-just ask Louden Swain. So the kid is, I'm assuming, the "star" wrestler on the team. The kid's coach, presumably, wants the kid's points at regionals/state. In light of those facts I don't really see what option the coach has: let the kid wrestle outside the team. Besides, who cares about winning some second-rate tourney? What matters are Regionals/State (well, and Conference Tourneys if they have them). 10 to 1 the coach is more concerned about the big tourneys than the weekly little tourneys that the kid might be missing. so, if you're a college coach do you get mad at your star wrestler if he wants to wrestle during college season in a non college event? I first saw Blake wrestle when he was about six, but I didnâ€™t pay much attention to events like Tulsa (still donâ€™t) so I donâ€™t recall that type of convo. Yes. That's why Kyle Snyder is at Ohio State. No other coach would allow such selfishness. No I don't think he is. It seems like a pretty contentious argument. The one guy says that if you commit to wrestling for your high school team that should be it, and that the off season is for stuff like this and the other side is saying he should be free to do what he wants. Then the first guy says that this type of thing is what is killing high school wrestling and it'll just end up being a club sport like soccer or basketball after a while. It's an interesting debate. Not if you are named Tom Ryan. In college wrestling most of the athletes get pushed whether they are wrestling a top 10 guy or an unranked guy. I think you take it on a case by case basis. Obviously you can't have guys missing team events when ever they feel like competing else where with other teams. But if you have a situation where it's not a key event for the team and the wrestler has the opportunity to get into a national caliber event elsewhere, I think you are happy for the kid and wish him the best. I don't buy into the mentality that you only compete for the HS or don't compete for them at all. Sounds pretty arrogant. He would not be eligible until one (1) full year from his last day of competition in Tulsa. Stiff penalty but its the same for travel baseball, AAU basketball and all other sports. Once the high school turns the student athletes name into the Tennessee Secondary School Athletic Association (TSSAA) that student athlete may not participate in any event that is not sanctioned by the TSSAA. Not all states are that stringent which is why I was curious. 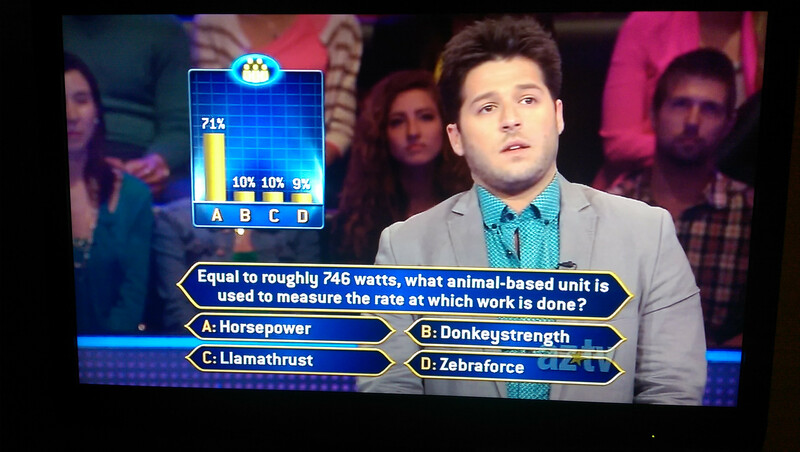 Well, I always rely on Zebraforce, even if it is less popular than Llamathrust. It is common for HS kids to wrestle in Tulsa. As olddirty mentioned, it is also commonplace for teams to send a select few to doc b, ironman, etc. Here in Colorado teams have a point system and they can't exceed a max number, so I wonder aloud if a large out of state tournament counts against the team and everyone is shorted a dual or two. What is really funny about this is that after seeing the four possible answers he still needed audience help. He's obviously not the brightest bulb in the universe.